Although ten-year-old Phillip is only a fourth grader, he knows what he wants to be when he grows up, and he’s studying now for his future. Phillip wants to be a chemist and is taking high level enrichment classes through IEA’s Academy. IEA has partnered with h-bar tutoring in Pasadena to offer exciting, instructive, hands-on classes year-round for motivated students like Phillip in grades 2-8. Classes are developed and taught by content area specialists – many of whom are Caltech PhD students – and typically focus on math, science or history. Recent courses include Biochemistry, Organic Chemistry, Mysteries of History, Rocket to Calculus and Sustainable Earth. New classes are introduced all the time; Playwriting, Astronomy and Theatre have been added for this year’s summer session. Parents often find out about Academy classes through word of mouth from other parents. “Phillip’s classmate’s mom told me about it, and I am very happy to know that IEA exists,” Phillip’s mom, Ming, said. Ming has since spread the word; at least two of Phillip’s classmates have also taken Academy classes, and another friend will be starting this summer. In addition to Academy classes, Phillip keeps busy with choir, basketball, piano, art, golf and Boy Scouts. He likes watching the Olympics and the NBA and will travel to China this summer. What is your favorite TV show or book? If you could create your own Academy class, what would it be? Academy classes run year-round at our office in South Pasadena, California. 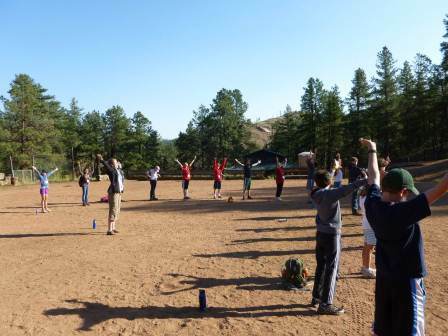 This summer, Academy will have two sessions: June 18 to July 6 and July 16 to August 2. Kids can take one to four classes in one or both of the sessions. For more information, an application and class schedules, visit the Academy page of our website. Sign up today! Have your kids participated in enrichment classes? What was their experience? Please share with us in the comments below. Lisa is the mother of 3 gifted children who lives outside of San Francisco. I feel responsible to a number: my son’s IQ score. I’ve spent 9 years struggling with my relationship to it. I’ve gone from feeling absolved of any responsibility to taking full responsibility for what the number means for his future. Eventually, I found a peaceful place in which the number and I can coexist. I just needed to see his IQ score for what it is: an invitation to challenge my assumptions about what giftedness means and to educate myself about my son’s needs. I received my son’s IQ score by accident. I shouldn’t have been surprised; after all, I hired a psychologist to have him assessed. She told me that she was going to give him a test to “see how he learns.” She was, after all, an expert, and I needed help. I had no idea that this was her euphemism for an IQ test. I contacted the psychologist when my son was in kindergarten. He was multiplying and dividing large “defense” and “attack” points while “dueling” with his older brother during Yu-Gi-Oh games. At the same time, my son’s intense nature took a turn for the worse. He cried every day on the walk to school. The timing of these two events made me wonder if his mathematical talent was connected to the distress he experienced on the way to school. It seemed coincidental, but I wasn’t sure. My husband and I talked about what to do. I thought he should be tested. I had no idea what he should be tested for, but I was sure that there was some sort of test that could help me better understand my son. My husband made a prophetic statement. He said, “Before you get him tested, you should know what you are going to do with the information.” I thought he was crazy. How could I know what to do before I got the results? When I received the results, I still had no idea what to do with them. Everyone else, however, thought they knew exactly what they meant and what I should do. According to my friends, my son was “cream,” as in “the cream will rise to the top.” Homework would be easy, GPAs would be high, and I didn’t need to do anything. The teachers at my son’s public school seemed to agree with this assessment. Their idea of differentiating the curriculum for him required no work on their part. They assigned projects and expected my son to extend and enhance them on his own. I call this type of differentiation “smart kids will act smart.” He didn’t oblige, so I changed tactics. I swung wildly to the other extreme and took full responsibility for ensuring that the promise indicated by the number was realized. We hired tutors and subscribed to online learning courses. We enrolled him in an independent school for gifted children. After all, if the IQ number represented my son’s ability, then a subpar GPA or SAT score would reflect an inadequate educational or family environment, right? This view of his IQ score fit my “middle child” sense of responsibility perfectly. It just wasn’t true. The substantial resources we directed to my son’s education turned out to be money and time well spent, though not exactly for the reasons I expected. I was not guaranteeing excellence; I was addressing challenges. I needed to reevaluate my assumptions about my son’s education much the same way that parents with children who have learning differences need to adjust their expectations about their children’s needs. It turns out that his emotional intensity is connected to his gifted intellect. His sensitivity to sensory stimulation exhausted him and made him irritable. His aptitude for pattern recognition caused him to overcomplicate simple tasks. His classmates’ reaction to his developmental asynchrony caused him to “dumb-down” his performance. When we changed his environment, he found peers who were similarly excited about learning and teachers who understood his occasional outbursts and celebrated his creative problem solving. He developed new passions and let some of his anxieties go. With the help of organizations like the Institute for Educational Advancement that study and support gifted children, I learned about my son’s needs. I still get it wrong, and it’s those stories I like to share because I learn more from my failures than my successes. 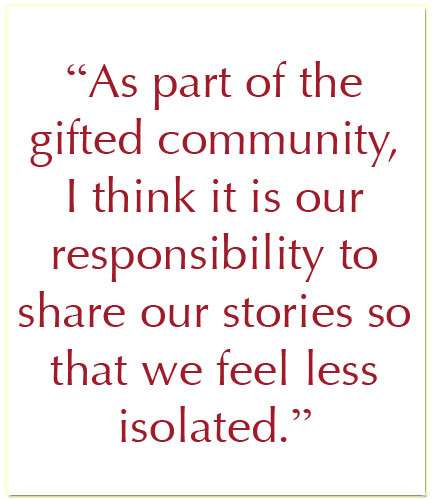 As part of the gifted community, I think it is our responsibility to share our stories so that we feel less isolated. So, I’ll start with this story, because I am, above all, very responsible. What was your experience when you first found out your child is gifted? Please share with us in the comment section below!